Now let me start by saying I definitely don’t make a habit of purchasing luxury handbags for myself on the regs (I wish) but recently, I had a pretty tough working week and at the end of it, feeling pretty proud of what I had accomplished, decided to pool my money together and splurge on the YSL Blogger Bag (what an apt name!). I’d had my eye on this little baby for a while, read many a review and watched countless unboxing videos on YouTube to make sure I wasn’t going to regret it; it’s a lot of money after all. When I was 100% sure this is what I wanted to go for, I decided to purchase it online from Farfetch – at the time, they were offering 10% off your first purchase with them in addition to free shipping so I managed to save about £70 which you can imagine I was pretty chuffed with! Farfetch collaborate with hundreds of boutiques around the globe; once you have chosen your order, they select which boutique it will come from and provide you with all the details. Mine was sent from the boutique Jofré in Barcelona. 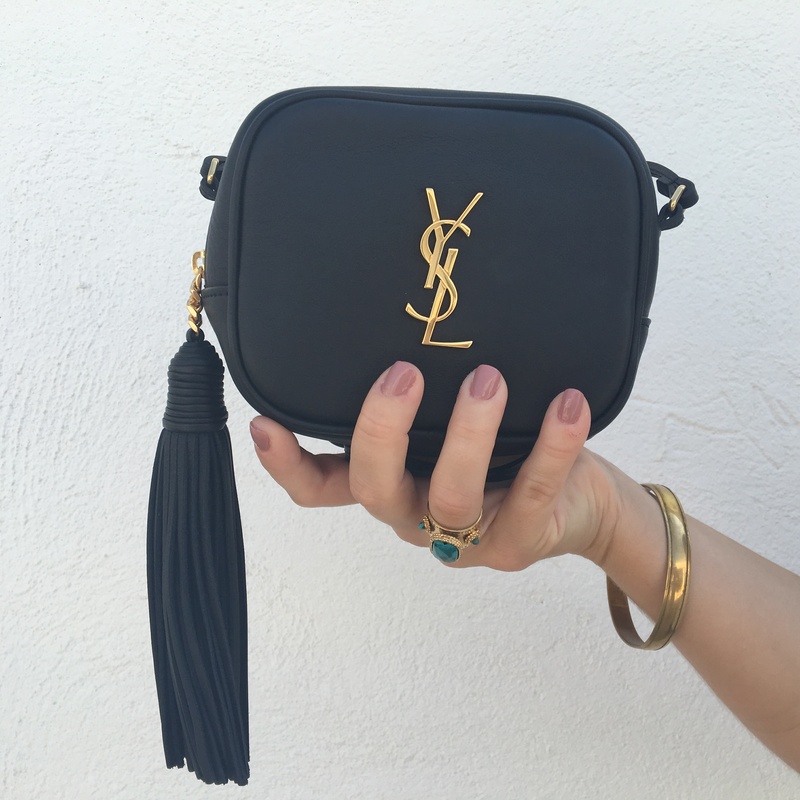 It arrived beautifully gift wrapped with a hand written note – very cute touch – in it’s very own Saint Laurent dustbag to keep it protected when you aren’t wearing it. As soon as I opened it, I was in love. I went for the black leather with gold hardware; classic and timeless. The leather is buttery soft, it has a long, thin leather cross body shoulder strap, a long leather tassle and on the back is a small pouch/slot. On the inside, it is surprisingly roomy for such a small bag and comes with four card slots – two on the front and two at the back. I’m in to my small bags anyway so this was perfect for me and it fits in all the essentials – my iPhone 6 (although I hear to fit an iPhone 6 Plus is a bit of a mission/impossible), keys, cards and cash, mirror and lipstick. I even managed to squish my sunglasses in the last time I wore it! Unfortunately, I think the Blogger bag in black is almost impossible to get hold of now due to its popularity but they do lots of other fun colours that you might want to check out.